Lewis Bruce after collecting the Sports Personality of the Year award at the 2014 Peterborough Telegraph Sports Awards. The most successful Peterborough Town skipper in the club’s history is preparing to stand down. 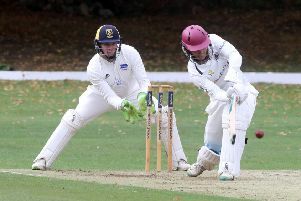 Lewis Bruce, who led Town to back-t0-back Northants Premier Division titles, two Northants Twenty/20 Cup wins and a place in National Twenty/20 Finals Day for the first time in the club’s history, is expected to make way for David Clarke. Work commitments (he has important exams next summer) and family commitments (he became a father for the first time last spring) have prompted the expected resignation. “I’m not sure I can give the time the job needs any more,” Bruce, the reigning Peterborough Telegraph Sports Personality of the Year, stated. “Next year is a big year for me at work and there’s every chance I will have to miss a couple of games. “On the field the job isn’t too difficult because the team is so strong, but it can be time-consuming dealing with off-field matters. If it was Bruce’s last game in charge last weekend, he finished in style. He claimed 5-23 with his off-spinners as Geddington were dismissed for 147 on the way to a six-wicket defeat. Paul McMahon, a pro Town are keen to retain next season, bagged 5-55 to take his tally of wickets for the season to 62, five short of Joe Dawborn, the Premier Division’s leading wicket-taker. Bruce topped the top flight averages (of those who took more than 10 wickets), capturing his 39 wickets at a shade over 10 apiece. The win over bottom clubGeddington ensured Town finished second, 35 points behind Rushden. Town had won the three previous Premier Division titles. “Lots of people have told me second place is still a good effort, but I don’t agree,” Bruce added. “We have become used to winning and our aim was a fourth straight title.